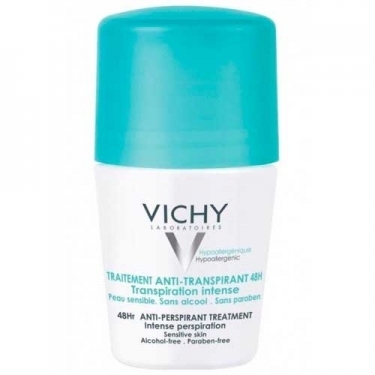 DESCRIPTION: Déodorant Traitement Transpiration Intense from Vichy is a perspiration regulator deodorant. Designed for those suffering from heavy sweating and looking efficacy without discomfort to the skin. With assets operating in the core of the sweat pores for a total protection for 48 hours. Dermatologically tested. Without perfume, alcohol or parabens. The texture provides a sense of freshness and softness and leaves the skin a similar film to dust in touch, no sticky effect. Leaves no trace on skin or clothing. Ideal for those suffering from heavy sweating.